In India, the Hotel & Restaurant Approval & Classification Committee (HRACC), a division under Ministry of Tourism is entrusted with the activity of classification of the Hotels into either Star Category Hotels (5 Star Deluxe, 5 Star, 4 Star, 3 Star, 2 Star & 1 Star) or Heritage Category Hotels (Heritage Grand, Heritage Classic & Heritage Basic) by inspecting & assessing the hotels based on the facilities and services offered. As per ‘Guidelines for Classification of Hotels’ issued by Ministry of Tourism (Hotel & Restaurant Division), ‘Paid Transportation on call’ is compulsory in hotels of 3 Star & above and Heritage Hotels. However, in order to provide the customer a greater luxury and to stay ahead in the competition, even hotels below 3 star rating are also providing transportation on call that is facility of making the cab available on call. Here, in this article I would like to discuss the different options available for a Hotel to provide cab facilities to their guests and respective implications under Service Tax law. Any Star Hotel and other establishment alike Hotel business may have an option to choose one of the following ways for providing cab services to their Guests. From the above picture, it is clearly evident the various alternatives available for the hotel for provision of cab to their guests. The hotel may appoint a vendor through which such services are provided or the hotel may maintain own fleet of vehicles either by purchasing or hiring of such cabs. Now that we have understood the various alternatives available, we shall proceed with discussion regarding the implications under service tax law. In this model, the hotel/restaurant appoints a vendor who sits at the reception for facilitating the booking of cab to the customers. It may also happen in certain cases, the hotel/restaurant books the cab using the online facility of the vendor. It is important to note that the hotel/restaurant only facilitates the provision of booking the cab but does not have any ownership/possession of such cabs. There might be two instances regarding the payment of cab charges by the guest. In some hotels/restaurants, the guest pays the cab charges directly to the vendor. In other cases, it might happen that, the hotel/restaurant recovers such cab charges through their bill and pays the same at actuals to the vendor. Now, let us see the implications under service tax under the two said instances. In this methodology, as stated above, hotel/restaurant does not charge any amount in their billings made to the guest (i.e., just acts as a facilitator between vendor and Guest). And also, hotel/restaurant shall not charge any amount for such facilitation service between vendor and guest. The guest pays cab charges directly to the vendor. Since there is no revenue generated by such facilitation provided by the hotel/restaurant, there shall not be any implications under service tax for the hotel/restaurant. However, if the hotel/restaurant is charging any rentals from the vendor for the space provided at the reception, the same shall be subjected to service tax under ‘renting of immovable property’. In this methodology, the hotel/restaurant provides the facility of on call booking and charges the guest towards the cab charges in the bill along with the accommodation services. Or it also might happen that the guest does not pay any specific amount towards cab services (in cases of complimentary services). In such a methodology, there might be different instances which require examination under service tax laws. The hotel/restaurant might offer the facility of cab to the guest as complimentary (as a part of the package), or charge the actuals from the guest and pay the same to the vendor or pay to the vendor after deducting the commission/fee. Now, we shall proceed with the implications under service tax for the instances mentioned above. It is the need of the hour for the hotels/restaurants to come up with various complimentary packages to attract the guests and stay ahead in the business. So, the hotel/restaurants might offer facility of pick and drop as part of the package taken by the guest. In such cases, there shall not be any specific consideration towards the cab services. However, the hotel/restaurant ends up paying to the vendor such cab charges. In such methodology, since the hotel/restaurant is providing one or more services to the guest as a bundle, the taxability of the consideration shall be decided based upon the principles of interpretation as provided in Section 66F of Finance Act, 1994. Vide sub-section (3) (a) of Section 66F, if various elements of service are naturally bundled in the ordinary course of business, it shall be treated as provision of single service which gives the bundle essential character. In the instant case, the accommodation service assumes the essential character of the bundle and accordingly the rate of service tax applicable to the accommodation service shall be applied on the entire consideration received from the guest. Further, the hotel/restaurant shall be subjected to service tax on the expenses paid to the vendor under the reverse/partial charge mechanism subject to the conditions specified under Notification No 30/2012-ST dated 20.06.2012. However, it is worth noting that the hotel/restaurant can absolve from payment of service tax under reverse/partial charge mechanism, if such hotel/restaurant takes a stand that they are also engaged in the similar line of business, because of the reason that Notification No 30/2012-ST dated 20.06.2012 specifies that reverse/partial charge mechanism shall not be applicable if the service receiver and service provider are engaged in the similar line of business. However, the challenge to the hotel/restaurant would be to convince authorities that they are also engaged in similar line of business. In this methodology, the hotel/restaurant books the cab for the guest and collects the cab charges from the guest in addition to the accommodation bill. However, the hotel/restaurant shall reimburse the same to the vendor without charging or retaining any amount. It is only to facilitate the guest a single point of payment is being provided. In such a methodology, the hotel/restaurant can claim exemption from payment of service tax in the capacity of pure agent subject to the conditions specified under Rule 5(2) of Service Tax (Determination of Value) Rules, 2006. The hotel/restaurant shall collect the cab charges plus service tax from the guest and pays the same to the vendor. Further, since the nature of expenses is of reimbursable, there shall not be any liability on the hotel/restaurant under reverse/partial charge mechanism. However, the authorities might object such stand taken by the hotel/restaurant and demand service tax under reverse/partial charge mechanism. 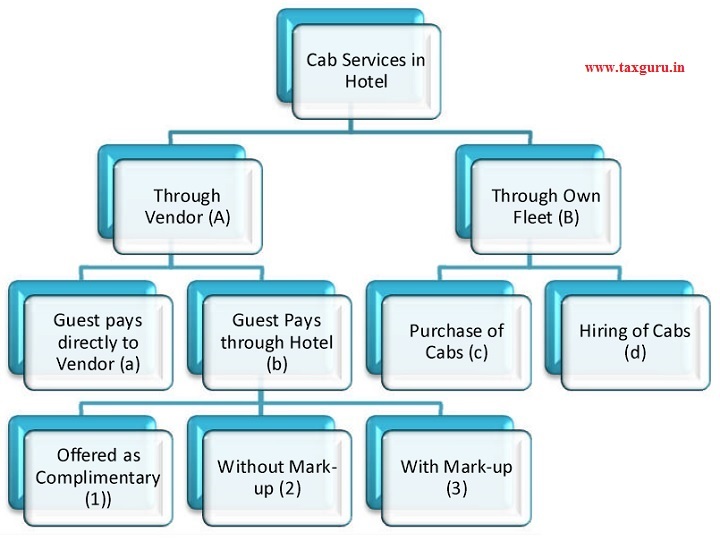 In this methodology, the hotel/restaurant books the cab for the guest and collects the cab charges from the guest in addition to the accommodation bill. The hotel/restaurant shall charge an additional amount apart from what is required to be paid to the vendor from the guest for provision of service. If the hotel/restaurant decides to charge service tax without availing abatement, then they can avail the cenvat credit of excise duty paid on capital goods and inputs and service tax paid on input services without any restrictions. If the hotel/restaurant decides to avail abatement as per S No 9 of Notification No 26/2012-ST dated 20.06.2012, then service tax has to be charged on 40% of the value of services towards provision of cab. The value of 60% can be taken as abatement subject to a condition that credit of inputs, capital goods and input services (other than mentioned below) shall not be availed. If the vendor is charging service tax on 40% value – then 100% of service tax can be taken as credit. Further, the reverse/partial charge mechanism as mentioned vide ‘Offered as Complimentary’ holds good. 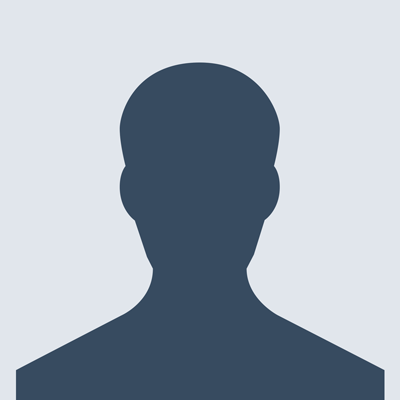 However, if the hotel/restaurant is other than body corporate and the guest is body corporate (billed to company cases), then there exists a liability under reverse/partial charge mechanism in the hands of the body corporate guest. Hence, body corporate guest is required to pay service tax on the cab charges remitted to the hotel/restaurant. In such a case, the hotel/restaurant who is other than body corporate and charges service tax on abated value need not collect service tax, since the obligation to pay service tax is on the corporate guest. If the hotel/restaurant is other than body corporate and charges service tax on the non-abated value, then hotel/restaurant has to collect and pay 50% of the service tax and the remaining 50% shall be paid by the corporate guest. In this model, the hotel/restaurant instead of sourcing cabs from a 3rd party, may maintain own fleet of vehicles either by purchase of motor vehicles or hiring the motor vehicles from 3rd party. Now, let us see the implications under service tax under the two said instances. In this model, the hotel/restaurant purchases motor vehicles for provision of cab facility to their guest. The hotel/restaurant shall obtain registration under ‘rent-a-cab’ service and file returns accordingly. The credit of excise duty paid on the purchase of motor vehicles shall be eligible as cenvat credit on capital goods, only if such motor vehicle is used for providing of output service as mentioned in the definition of ‘capital goods’ as per Rule 2(a) of Cenvat Credit Rules, 2004. One of the services mentioned therein is the usage for transportation of passengers. 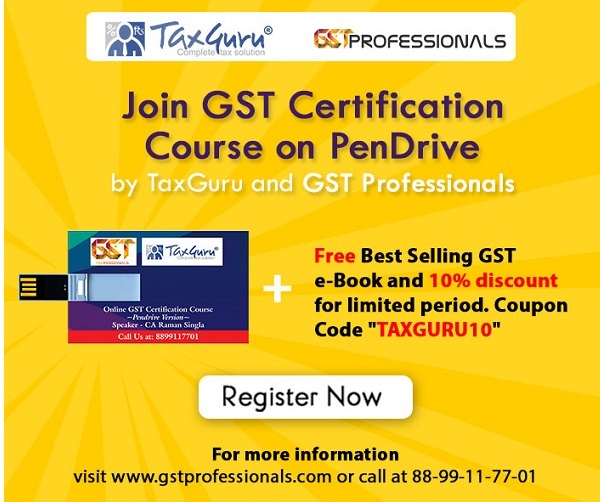 Since, in the instant case, the guest can be called as passengers, the credit of excise duty paid shall be eligible as cenvat credit under capital goods. If the hotel/restaurant decides to avail abatement as per S No 9 of Notification No 26/2012-ST dated 20.06.2012,, then service tax has to be charged on 40% of the value of services towards provision of cab. The value of 60% can be taken as abatement subject to a condition that credit of inputs, capital goods and input services shall not be availed. It is very important to maintain the vehicles in an efficient condition to provide timely services to the guests. Hence, it is mandatory for the hotel/restaurant to get the vehicles maintained periodically by sending the vehicles to authorised service stations. In such a scenario, if the hotel/restaurant is a body corporate and such authorised service station is other than body corporate, then the hotel/restaurant shall be obliged to pay service tax under works contract services by virtue of partial reverse charge mechanism. The hotel/restaurant can either pay service tax to the extent of 50% on 70% of the value of the bill of authorised service station or pay 50% on the labour portion of the bill of authorised service station. Under this model, the hotel/restaurant instead of purchasing the motor vehicles, opt for hiring of the same from 3rd party. The vendor shall leave the car at the disposal of the hotel/restaurant and collects periodical rentals from the later. If the hotel/restaurant decides to avail abatement as per S No 9 of Notification No 26/2012-ST dated 20.06.2012,, then service tax has to be charged on 40% of the value of services towards provision of cab. The value of 60% can be taken as abatement subject to a condition that credit of inputs, capital goods and input services (other than mentioned below) shall not be availed. It so happens that the vendor shall provide the motor vehicle on hire to the hotel/restaurants and collect the rentals from the later. The cost pertaining to the fuel and other services might not get added to the consideration (because they will be on the account of hotel/restaurant), but the vendor might charge service tax on 40% of the value of rentals as per S No 9 of Notification No 26/2012-ST dated 20.06.2012. In order to curb such practices, an explanation is inserted to include the fair market value of all goods (including fuel) and services provided by service recipient in the gross amount charged in order to claim abatement of 60% of the value.